Starting tomorrow, iOS users will be prompted to update their devices to the newest iteration of Apple's mobile operating system. As difficult as it is to believe, we're already onto the sixth version of the OS, which continues to be updated with new features on a yearly basis. After pushing out so many upgrades critical to plugging a few major feature holes, the vast majority of its 200 advertised enhancements are strictly granular, as Apple continues to polish its popular OS. That doesn't mean, though, that this build is coming to the masses without any jarring UI changes: Apple has declared independence from Google by adopting its own Maps, added a few nice features to Mail and iCloud, thrown Facebook integration into the mix and introduced the Passbook for paperless tickets. The question is, how does it stack up against previous refreshes? Read on to find out. iOS 6 packs in plenty of improvements, but lacks the pizzazz we've seen in previous updates. 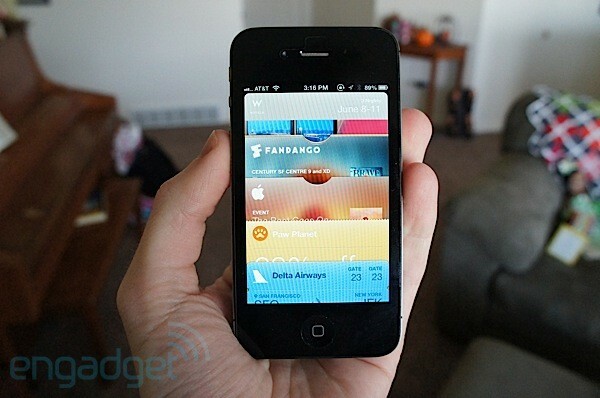 How would you rate the iOS 6? Now, let's see which features are available to iPad and iPod Touch owners. As you can see, iPhone 3GS users will have a different user experience than folks who have already upgraded to a newer model. The key question, then, concerns the performance of the older hardware; as history is quick to remind, the 3G didn't fare so well on iOS 4. After a brief period of time using the 3GS, we noticed that some features work better on iOS 6 than its predecessor. The animations are still choppy and lack the buttery-smooth behavior of newer iPhones, but firing up the camera and maps are slightly more peppy. Typing, unfortunately, continues to give us fits. While it's still slower than we've become accustomed to with later generations of devices, it appears that the iOS experience won't be any worse for current 3GS users than it already is -- but it likely won't be any better, either. To ask Apple to depart from its tried-and-true user interface in favor of something different, unique or (dare we say) revolutionary after six years would be like asking a dentist to stop brushing his teeth. The company is loathe to stray very far from its proven UI, and as a result each subsequent iteration has felt like Apple checking off missing features on a to-do list. If a time traveler went back to 2007 and showed off the iPhone as it looks today, Joe Cool off the street would not only be able to tell it's running the same OS; he'd likely be able to master it without any further instruction. That's not to say Apple doesn't make large changes to the way iOS looks and feels -- over the years, the company has thrown in new user interface elements such as the App Store, multitasking and the Notification Center, among other things. But Apple has sprinkled in these additions without breaking from its mold. Aside from the larger screen size and extra row of icons on the iPhone 5, iOS 6 barely changes the way you'll interact with the iPhone and iPad. Unless you're looking at the new Passbook icon or the Facebook option in your Notification Center, you may have a difficult time telling which version you're using without diving into the settings. Just because the general layout is ultimately the same, does that mean Apple hasn't progressed? Well, not exactly -- again, it's added around 200 new features to the mix. Still, we can't shake the feeling that this latest update is the most granular we've seen to date. Let's break down the firmware refresh by section and show you what iOS 6 has to offer. 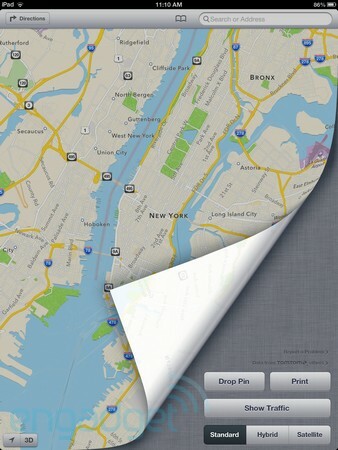 One of the most striking changes to the iOS landscape is the Maps application. The winds of change have been blowing quietly in Cupertino for years: the outfit purchased three different mapping companies, beginning with Placebase in 2009, Poly9 in 2010 and C3 Technologies in 2011. Since then, it's also forged partnerships with TomTom and OpenStreetMaps, among other navigation companies. In short, the writing has been on the wall for a long time, but it's only now, with iOS 6, that Apple is finally distancing itself from Google. When you request directions, you'll not only get step-by-step instructions; you'll also have the option of choosing one of several alternate routes. Once you settle on the best way to get there, you can hit "Start" to fire up navigation mode, at which point Siri starts barking out orders. A note on Apple's preferred style of skeuomorphism: every step appears at the top of your screen in the form of a street sign, giving you the distance as well as a heads up about what to do next. What if you prefer to leave the display off and simply listen for the voice prompts? The app can run in the background, and your lock screen wallpaper even turns into the current navigation step, so you won't be tempted to touch your phone and unlock the screen. It's a clever addition, and we suspect drivers will appreciate that little detail. Traffic data is also presented in these new Maps. Granted, this was already a feature on iOS, but it's much improved here. The information is now crowdsourced, meaning Apple will judge traffic by looking at your speed and position (not to mention, millions of other commuters with iPhones). This allows for more accurate real-time reporting of delays, accidents and other complications that might cause you to be late for work. 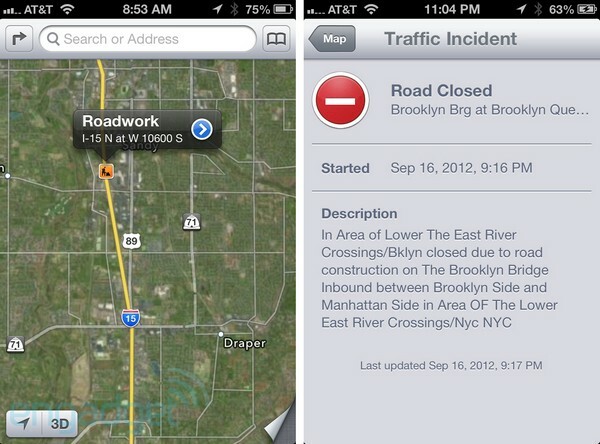 (While iOS had traffic reports with Google Maps, the data was only crowdsourced by Android users.) Road construction and closures appear as small icons; click on one and a card will pop up from the side, giving you all the information you need about the hold-up. 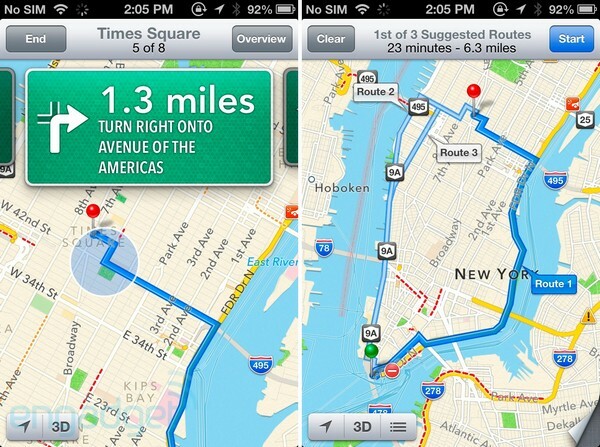 Maps will also recommend new routes if it determines you'll save commuting time by making the switch. Speaking of which, small icons can be found all over the place as points of interest. Click on a restaurant icon and you'll be greeted by its name, overall Yelp rating and options to get directions or contact information. You can also go directly into its Yelp page and take a peek at individual reviews. (Apple also cleverly sneaked in an easter egg: all of its stores are represented by an Apple logo.) Google Street View fans will be disappointed to see that there isn't really an equivalent feature here. Still, you'll still be treated to a couple new options that aim to provide a similar level of granular detail. Flyover is Apple's take on the "birds-eye view" feature found on Bing Maps: you get a 3D render depicting an aerial view of large cities as if you were, you know, flying over them. This means you can see streets, parks, buildings and every other aspect of the city -- and you can finally use multitouch gestures to rotate the maps (again, this was a Google Maps feature sorely missed on iOS). You won't find the Flyover feature available everywhere yet, but it's so far available in a handful of major cities, with more to follow. In case you can't make use of Flyover, you should be able to take advantage of 3D view, which comes complete with Google Earth-like topographical capabilities -- pan over a mountain, for instance, and you can see the various canyons, slopes and other details. Rounding out the feature list, the Maps application also includes pinch-out maps that let you see a globe view, and information cards for businesses and points of interest. Big city folk, you're going to have one significant qualm with the new Maps: there are no public transportation options for navigation. The button is present (next to driving and walking) when you plug in your destination, but when you attempt to set up a route, you're taken to a "Routing Apps" screen that makes references to the App Store. This makes sense, given that Apple is supplying developers with a transit API, but we can't imagine that homegrown public transit options aren't already in the works. Until an official solution is put into place, however, this omission is likely to frustrate urbanites who rely on subways and buses as their primary means of getting around. We also noticed that there may be some amount of concern with the infant Maps search results. Apple has partnered with Yelp, a highly respected service with a healthy database of its own, but plenty of businesses not aligned with the site may be missing out. In our comparisons between the old Maps and new, we found that the results varied wildly between the two: Google typically yielded more results, though we noticed that the new Maps was able to find some businesses and points of interest that Google couldn't. 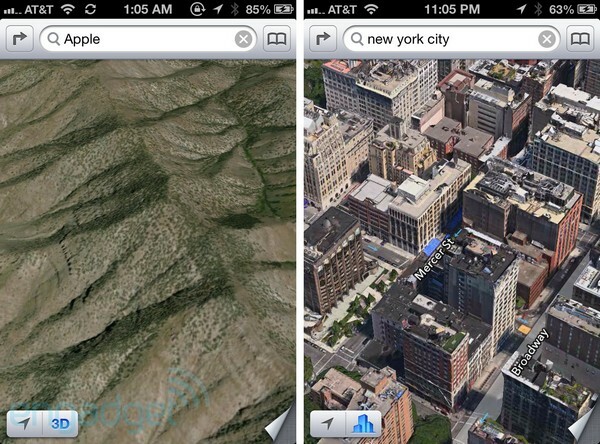 If you're missing the old Maps, there may be some good news on the horizon: Google is rumored to be working on its own standalone Maps app for iOS, which would give users the best of both worlds. In general, the new Maps is a work in progress and won't be perfect. It may even be frustrating for many users who have grown accustomed to the familiar look and feel of Google Maps. However, we're intrigued by the direction Apple has taken (pun intended); Apple is now addressing many concerns we've had with Maps in the past, and though there are certainly some things that need massaging, we're optimistic that the app will continue to expand in scope, coverage and functionality. Back when it was announced in June, Passbook was the one addition to iOS that had many people predicting the iPhone 5 would come with Near-Field Communications (NFC) built-in. Why? The feature's main function is to act as a wallet of sorts: instead of hunting through your iPhone to find a barcode, coupon or boarding pass, you can find these types of items bundled together in one place. It wouldn't be difficult to imagine this application being expanded to include mobile payments and maybe even work badges, hotel room cards and car keys compatible. As you may have seen in last week's keynote, such wireless technology didn't even get a mention. The iPhone 5 does not, in fact, have NFC, and gossip-mongers will likely turn their attention to next year's model (the iPhone 5S?). But this doesn't mean Passbook is useless in the meantime. On the contrary, anyone who shops, travels or attends concerts and other events will likely find it convenient. As new items begin to pour into your Passbook, they'll show up as a stack of tabs, each one spanning the width of an iPhone screen. Pull up any tab and it'll be presented as a card, complete with barcodes and any other relevant information. (Delta boarding passes, for instance, will look very similar to the ones you'd find in the official iOS app, and are just as scannable.) Whenever you have multiple items in a specific category -- let's say you've purchased tickets to more than one concert -- they'll show up under the same tab. The first card will be seen, but you'll need to swipe horizontally to check out the rest. This can be a little confusing the first few times you use it, so be careful not to lose your bearings. 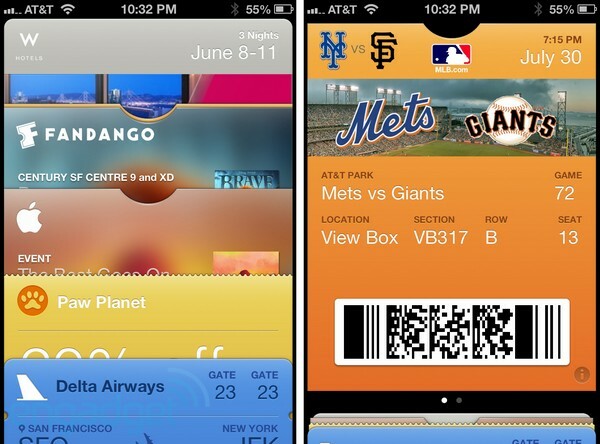 Fortunately, Passbook has also been integrated with the iOS lock screen, which means your boarding passes and event tickets will appear there as notifications when the time approaches. Overall, the convenience of this new feature intrigues us, and it should become even more useful over time as more developers take advantage of it. We sadly weren't able to test it with real boarding passes or coupons, but we were able to generate a few sample cards via a third-party website to get a good idea of the user experience (have a look at our screenshots to see what we're talking about). iOS 5 users will likely be familiar with these two geolocation apps -- Find my iPhone can help you locate a lost or stolen device, while Find my Friends will let you hunt down your family, friends and colleagues -- and with iOS 6, they'll look much the same. However, they've still been enhanced with new features that should make the apps even more tempting to use. For starters, Find my iPhone is now introducing a "Lost Mode," a new option which triggers an alert sound on the device and provides a remotely set phone number for good Samaritans to call and coordinate a place to return it. Find my Friends has been upgraded to add a geofencing notification system: you'll be alerted with a notification whenever your friend or family member leaves or arrives at a certain location. Does your mother tell you to text her when you get home? 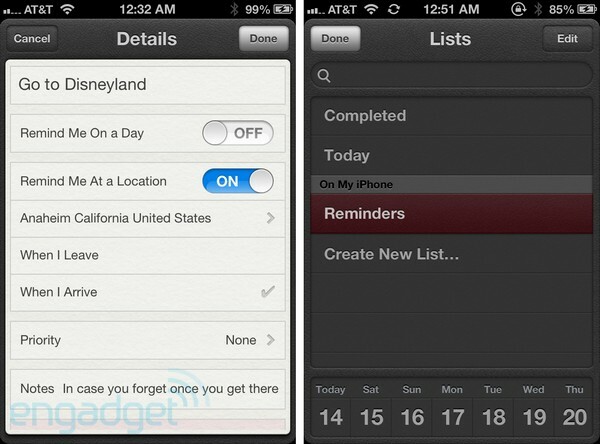 If she has iOS 6, that's no longer necessary -- she can be notified when you get back. What if you're worried about your kids getting to and from school? Find my Friends will likely add precious years back to your life. Staying on the subject of location-based features, the beloved Reminders app received a couple minor but much-needed enhancements. Chief among them is the ability to add locations manually. When the app debuted last year, we loved the idea of receiving a notification when arriving or leaving a certain location (hey, we all forget stuff sometimes), but until now we didn't have the option of putting in any address we wanted unless we happened to be there. No more. Additionally, reminders now show up on iCloud.com (along with notes, by the way), which makes cross-platform management much simpler. Lastly, you'll now be able to rearrange your reminders, add custom lists and have notification badges nag you when an outstanding task still needs to get done. 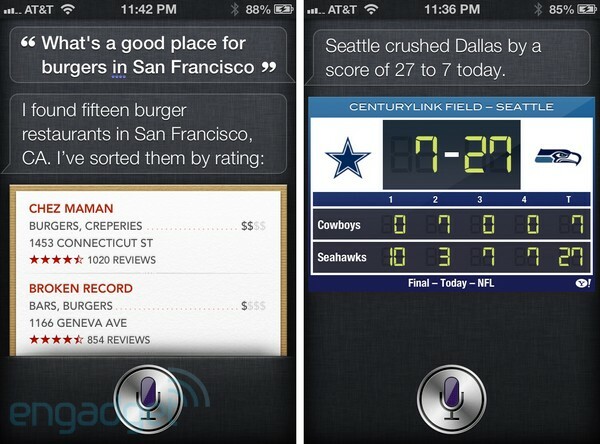 Brace yourselves for the onslaught of new Siri commercials: with iOS 6, the virtual assistant is adding a few more tricks to her repertoire. It's hard to know where to begin: first, the program studied up on several new languages (listed below); it's capable of looking up sports scores from nearly every major US league as well as a heap of international ones (you'll find the full list of supported leagues below as well); you can look up movie reviews and ratings courtesy of Rotten Tomatoes; you can get Yelp reviews, find restaurants and make OpenTable reservations; and you can also launch apps directly from Siri, which can be incredibly beneficial if you have a large collection. Siri handled our requests without too many misunderstandings. There were a few times we had to rephrase our queries (it had a difficult time understanding us when we pronounced Mexican restaurants, for instance), but in general we were able to ask the same question in many different ways without stumping the computer. 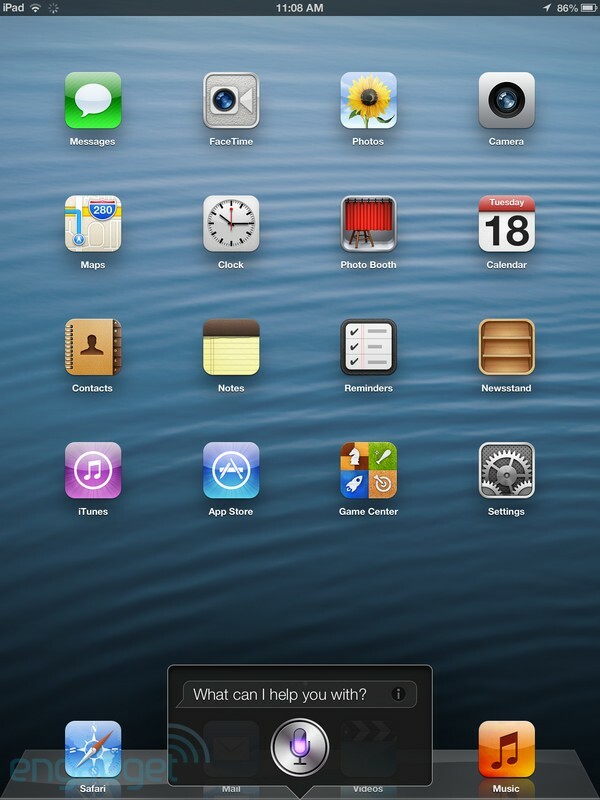 While we primarily used Siri on an iPhone 4S, iOS 6 is bringing the virtual assistant to the new iPad (2012 version) as well. This brings the grand total of iOS devices capable of using Siri to four: the iPhone 4S, iPhone 5, iPod Touch (5th generation) and the new iPad. There's still one more enhancement worth mentioning, though we admittedly haven't had the opportunity to test it: Eyes-Free Mode. We've all seen advertisements from car companies that show a driver making a phone call or getting directions just by pressing a button on the steering wheel. With iOS 6, manufacturers will be able to install Siri into cars in pretty much the same exact manner. Once this happens, all you'll have to do is press the voice command button on the wheel and ask Siri to get directions, make calls, play music and send messages. Interesting stuff, but the success of this feature ultimately depends on how many car makers adopt it. 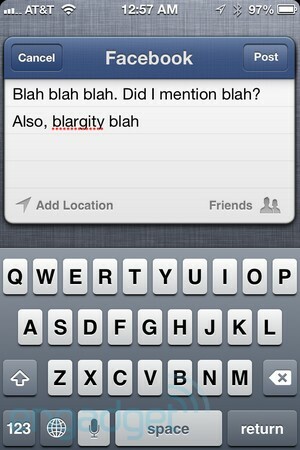 Twitter had its day when iOS 5 came out, complete with deep integration in the OS, but Facebook was curiously absent. That's now been resolved in version six (as well as OS X Mountain Lion): the service has been fully integrated into the Notification Center, Siri and core apps. Also, Apple has released an API for third-party app access, and Facebook contact information in particular, can more easily be integrated into the address book. Just like users did with Twitter last year, you just head to the settings menu and scroll down far enough until the social media options pop out at you. Once you sign in, you'll be able to tell Siri to post a message to Facebook or manually type it in by pressing "Tap to Post" in the Notification Center. Perhaps you've noticed a theme by now: iOS 6, by and large, addresses the small things. We'd say Do Not Disturb definitely qualifies. The concept of this feature isn't new to the smartphone world, but it's one you'll use on a nightly basis -- think of how many times you've accidentally left the volume up overnight only to be rattled out of sleep because a Facebook friend wanted to invite you to use MyCalendar. With Do Not Disturb, iOS will silence all notifications as well as any calls you wish to ignore. You can tell the iPhone to allow calls from your favorites, your full contacts list (shunning numbers that are unknown to you), everybody or nobody at all. But what if it's somebody calling from an unknown number about a legitimate emergency? Enable repeated calls in the settings menu, which will allow calls from anybody who tries a second time within three minutes. Naysayers may argue that it's easy enough to put the phone into silent mode or go through the process of turning individual notifications off, but what if there's a legitimate emergency and a loved one needs to get in touch with you right away? The option is there, and a lot of people have been asking for something like this for years. The phone app in iOS has been largely untouched over the years, its iconic dialpad seemingly keeping its age rather well. After being left alone for so long, however, Apple felt it was time to give the application a nip and a tuck. The first thing you'll notice is a completely new look to the dialpad: gone are the dark blue keys, while the white buttons are here to stay. Obviously, that's not much of an enhancement from a functionality standpoint -- it's just such a departure from the iconic look that we've become so accustomed to over the years. Still, there are some more beneficial improvements. 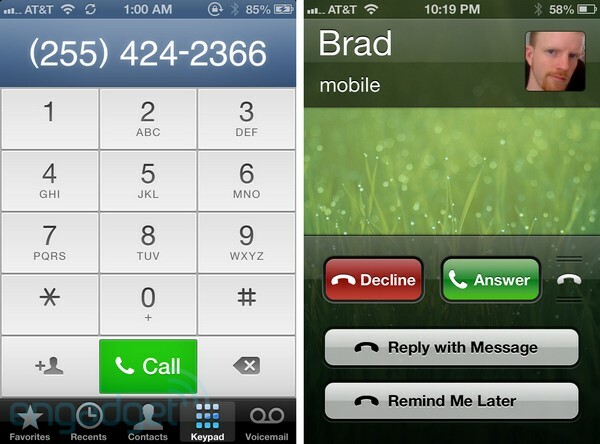 Incoming calls can be rejected with two new options: reply with message and remind me later. Reply with message is exactly what it sounds like -- you can choose from a small selection of canned texts (including a customizable one) that will be sent to the caller automatically. Remind me later sets up a reminder for you to make sure you call the person back. While we're on the subject of phoning friends, family or colleagues, let's not skim over another critical feature in iOS 6 (provided you didn't jailbreak your iOS 5 device, of course): FaceTime over cellular. Indeed, using Apple's video chat service no longer is restricted to a WiFi-only connection; you can now take advantage of this ability over any 3G or 4G network. Of course, there are a few catches: just like with tethering a few years ago, the availability of this feature all depends on your carrier and how much data your plan allows. Most operators seem to have no problem letting you get in a face-to-face chat while using their network (and to clarify, FaceTime uses data, not minutes) -- but that's not always the case. AT&T, for instance, only offers the feature to its Mobile Share customers, while anyone on grandfathered unlimited data or the old tiered plans will have to continue relying on WiFi networks. Before you get too upset about this, keep in mind that you can still easily use Skype or any other third-party video chat service without a problem -- the only real concern is making sure all of your chatting buddies are using the same service as well. Remember iCloud? While most of Apple's recent work involving the year-old cloud storage and backup service has been centered around Mountain Lion, the company isn't about to let an iOS update go by without a few tweaks. For iOS 6, the Safari mobile browser now includes iCloud tabs, which -- you guessed it -- sync your open tabs between iOS and OS X devices. Worried about the limited space to work with? The iPad now offers support for up to 24 tabs, so feel free to go crazy with your wild web-surfing habits. Additionally, there's a new sharing menu in Safari. This menu, which is designed to look more like an iOS folder with icons rather than a vertical list of buttons, can actually be found in multiple places in the operating system. One of the options in Safari's menu is to add a page to an offline reading list. 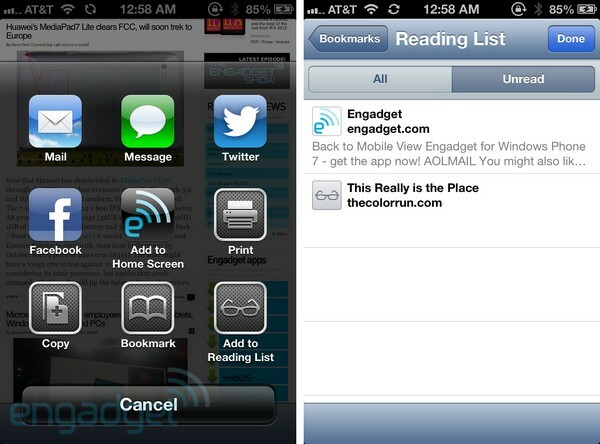 Yes, you could already make reading lists in iOS 5, but they were essentially nothing more than glorified bookmarks; the new functionality is more Instapaper-like in design because it will now save the web pages as well as the links. Not only is Safari speedier, it also finds a way to add precious pixels to the webpage you're viewing by offering a fullscreen view whilst in landscape. Just click on the icon on the bottom right and you're set. The Notification Center largely has the same look and feel, complete with the love-it-or-hate-it grey background and tiny buttons for clearing out notifications. 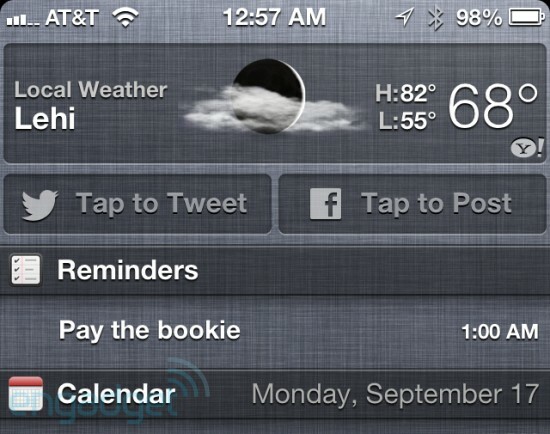 It's also still void of any third-party widgets, which is something we've been begging for since last year. The improvements Apple has made are certainly welcome, though relatively minor: the "Tap to Post" button; calendar items now show ending times and dates; notification statuses are synced across iOS devices; and individual mail accounts now have customizable notifications. 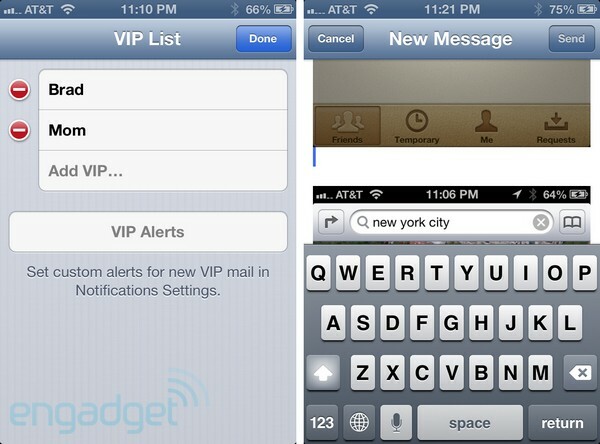 Additionally, message previews can be toggled on and off for alerts now. Though the Notification Center continues to improve, there are still a few features on our list that need to be touched upon. For instance, we'd prefer to have direct access to the Center from the lock screen, a "clear all" button for all notifications, more gesture support and broader widget options (an Airplane Mode toggle button would be absolutely divine, and we'd love to see what kinds of stuff third-party devs can think of). Another area of iOS that has received a major facelift is the App Store. While the user interface has been the subject of a few minor alterations here and there since the marketplace's birth, this year's adjustment may very well be the most distinguished yet. The most polarizing change will be Apple's switch to a card-style search interface. Likely, we're seeing the fruits of the company's acquisition of Chomp, as it certainly should credit the former app search service with some of its inspiration. 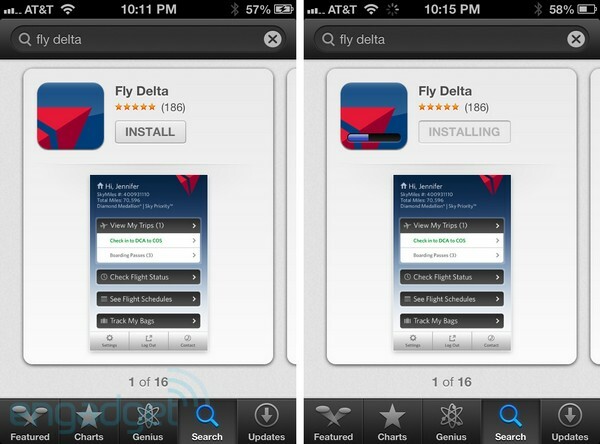 With iOS 6, conducting an app search will reward you with a webOS-esque card layout. Each card displays the name, rating, app icon and screenshot of each given app. On the iPad you'll be presented with a four-card view, but iPhone users will get one at a time and will need to swipe right-to-left to check out more results. Got a bunch of pictures from that wild and crazy family reunion that you just can't wait to use to blackmail your cousins? Shared Photo Streams lets you show off those embarrassing snapshots before you even get home. Here's how it works: pick out the best of the bunch, throw it into its own Photo Stream album and it gets uploaded to the cloud and becomes available as its own unique URL. From there you can make the album public or simply share the link on Twitter, Facebook or via email or messaging. Also, the shared photos can be commented on and liked in a manner similar to Facebook. The best part? Photo streams don't count against your iCloud storage. The changes to the camera app are few but pleasant. 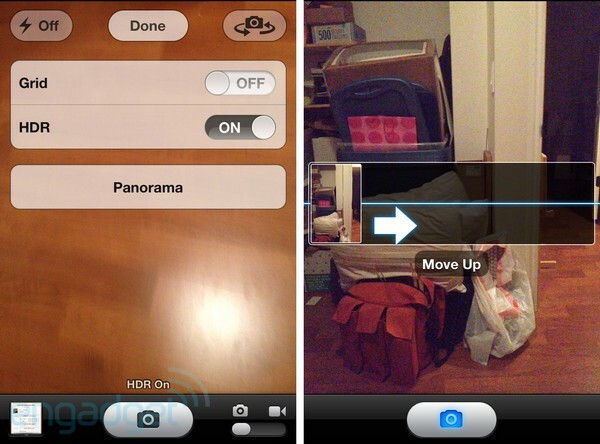 Only one actual feature has been added: a panorama mode is now offered on the iPhone 5, iPhone 4S and iPod touch (fifth generation). To access it, hit the options button on the top of the viewfinder and it's listed right below the HDR toggle. There's not much here that needs explaining, to be honest -- your shots span roughly 270 degrees, and the images, capable of churning out pictures up to 28 megapixels in size, turn out incredibly smooth. When taking the images, you're given warnings if you need to slow down, and an arrow goes up or down with your movements, letting you know that you need to adjust your position to get a better shot. The iOS 6 camera also boasts improvements in HDR performance. We grabbed an iPhone 4S with iOS 5.1 and a 4S with iOS 6, and took several side-by-side comparison shots with HDR turned on, and the improvements are slight but easily visible nonetheless. The iPhone with iOS 6 consistently captured more realistic color, while the device equipped with 5.1 snapped quite a few shots with washed-out colors and many of them featured contrasts that were too deep for our taste. Take a look below to see galleries of images taken by both phones and compare them for yourself. As an incredibly brief sidenote, the camera app also witnessed a change in color scheme, with the design moving to black instead of the old-fashioned white. Ah, the Game Center. Ever since it came into the public eye with iOS 4, it's grown by leaps and bounds, and is now being integrated into OS X in a manner similar to iCloud. Naturally, as games, the ecosystem and Apple's support structure continue to improve, so should the Center itself. 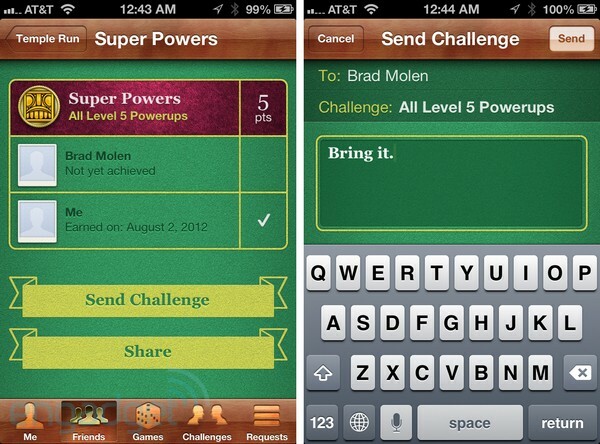 In its third year of life, the Game Center will now offer challenges, the ability to find friends via Facebook and cross-platform turn-based (as well as real-time) gaming between iOS and OS X. There's a reason we see videos of educational and usability features in every iOS keynote: these things are incredibly important to Apple, and indeed, new functionality has been added with every major upgrade to ensure iOS appeals to as many people as possible. 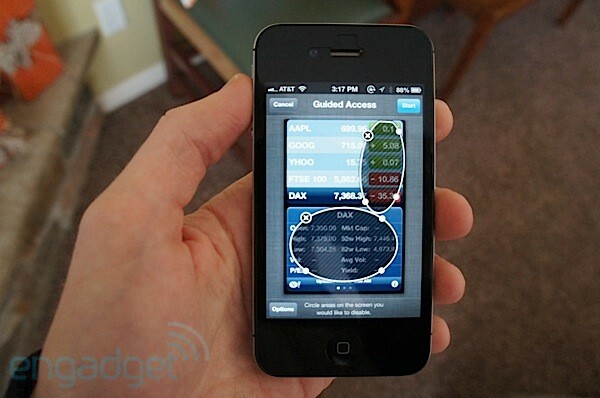 With Guided Access making its debut, iOS 6 is no different. There are a few things Guided Access can do: it can disable the home button when you're in an app, preventing the user from wandering to another program. You can even turn off touch or motion control to whatever part of the screen you see fit. The single-app mode can be useful to parents and teachers who enjoy the educational quality of iOS apps but want to make sure kids and students don't sneak in a game or two of Temple Run. (That's what we would've done if we had iPads at that age, anyway.) The option to disable touch is great if there's a button you don't want your kids pressing, for iPads installed at kiosks or even for presenters who don't want to accidentally press the wrong buttons. We admit, we haven't tried to count all of the 200-some-odd features in ioS 6 -- Apple doesn't officially list each one, and it hasn't even clarified what counts as a feature. But of the plethora of improvements and enhancements we already know about, we've yet to cover the vast majority of them in this review. In this section we'll discuss many of the miscellaneous features that may not have warranted a section of their own, but still may be of interest. Music: The app has a new, streamlined interface and an extra equalizer mode (Late Night). In what must be one of the smallest feature additions, the reflection on the metallic slider knob in the Now Playing screen actually changes as you tilt your phone from side to side. It's not going to make or break your decision to buy an iPhone 5, natch, but it's a small easter egg that will capture your attention for a solid 20 seconds. YouTube: Apple dropped support for a stock YouTube app, but Google has already pushed out a separate app of its own that you can download from the App Store. 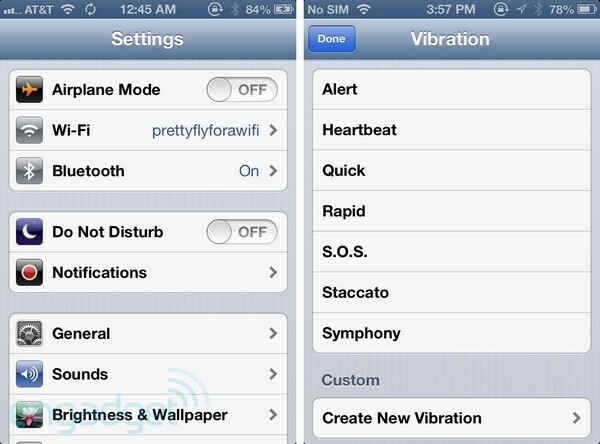 Features for Chinese users: With iOS 6, Apple has added more support for its Chinese customers. Among the list of improvements: Baidu, Sina Weibo, Tudou, Youku, Chinese dictionary and improved text input. 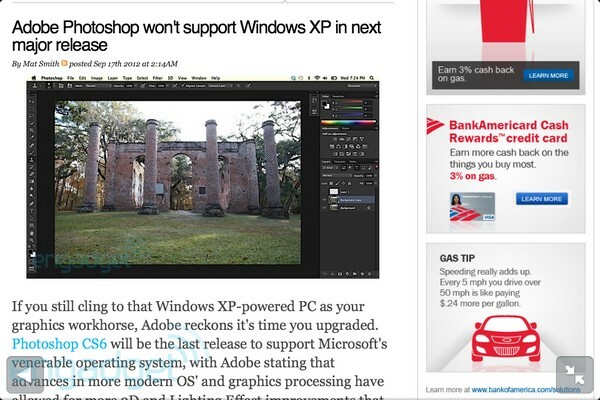 This aligns nicely with OS X Mountain Lion, which introduced these same features as well. Contacts: You can now search all available fields and add custom SMS alert vibrations for each individual contact. iTunes: It comes with an updated UI, and content can now be purchased from within apps. iCloud: We've discussed a few iCloud-centric feature improvements already, but an important addition that's worth a mention is that Apple's cloud service can now sync your personal dictionary. In other words, all of your typing shortcuts and preferences can be backed up via the cloud and restored along with everything else. Clock: Rather than having to go through a vigorous workaround routine to crank out custom ringtones just for your alarm, you can now go through the music app to decide which song to wake up to. Additionally, a clock app has now been added to the iPad, and the clock icon has slightly changed. 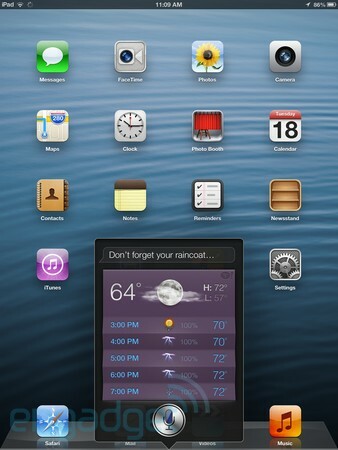 Weather: You'll enjoy a cleaner user interface within the weather app. And yes, the weather icon still shows a bright and sunny 73 degrees, in case you're curious. Let's face it: if you're an existing iOS developer, you've likely been using all four beta releases of iOS 6, and you probably already know of the various APIs and other tools that Apple has provided. But we believe that a brief listing of the latest dev opportunities are important to the everyday iPhone or iPad user; it gives you an idea of the direction iOS apps are heading and what developers are possibly working on right now. Though Apple says it has added 200 features, a significant proportion can't be seen until you begin digging deep for them. But at this stage in the mobile game, what's left for the tech giant to do but continue scratching off items from a dwindling list of missing features? If you're a longtime fan of iOS, you'll find yourself in the middle of a mental debate. You may be slightly disappointed that iOS 6 isn't a revolutionary update; with the exception of the new Maps and Passbook, there aren't many major feature changes or revisions that will leave you eagerly counting down the time it takes to download and install the update. With iOS 6, Apple seems to be more focused on refining the overall user experience than debuting significant new feature additions. On the other hand, it's still an improvement over iOS 5. But let's face it -- this won't be a difficult decision to make. Indeed, there's very little reason not to hit the upgrade button. Tim Stevens and Joe Pollicino contributed to this review.